What started out to be a simple beach activation of this historic Marconi site turned into a great adventure. A group of QRPers including Pi/K1RV, Steve/wG0AT, Chris/W6HFP, and Guy/N7UN activated this site on March 11 pm and March 12 am. Operation included 160m QRP, and 80m through 17m QRO on March 12th using the historic early Marconi callsign, W1M. Because of some fortuitous circumstances, we are staying overnight at the USCG Station at Marconi Beach and will have access to a wire dipole hung from a 90' site tower. We had a blast and it was great to learn the history of Marconi's efforts from Whitey/K1VV and Ranger Barbara/N1NS and a visit to the National Park Headquarters to see an original spark gap transmitter and reciever. This is an original site picture in the 1910's. The beach "dropoff", due to beach erosion, is now back to the rear tower footings which is all that remains of the original installation. By the way, those towers were made of wood and were 200 ft tall! Thanks to all we worked as W1M. 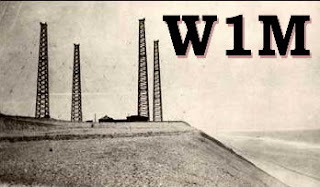 See http://www.qrz.com/db/W1M for QSL and more information. See Steve's/wG0AT great video of this operation, original site pictures and a "demo" of a spark gap transmitter! Wow! What a great week in the Caribbean paradise of St Lucia. Chris/W6HFP, Steve/wG0AT, and myself "left the villa everyday" for beach, vista locations, or mountain-topping field HF portable operations. 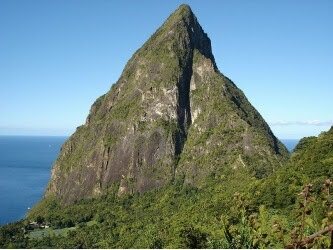 We rented some mountain bikes which let us explore nearby local beaches but one day we drove the 60km south to Soufriere to climb Pitit Piton, the classic photographer's icon of St Lucia. WHY you ask? The bottom line: I'm an adventure junkie...coupled with the desire to HF activate "memorable" locations! Crazy? Yes, but it was "more than fun!" See the wG0AT video of this "extreme QRP adventure!" The weather was perfect up top since the wind was blowing over the top of us. We spent two hours making contacts primarily with Eu and the US. Memorable...you bet! See our mini-dxpedition website for more information about St Lucia, our villa, and obtaining ham radio licenses.